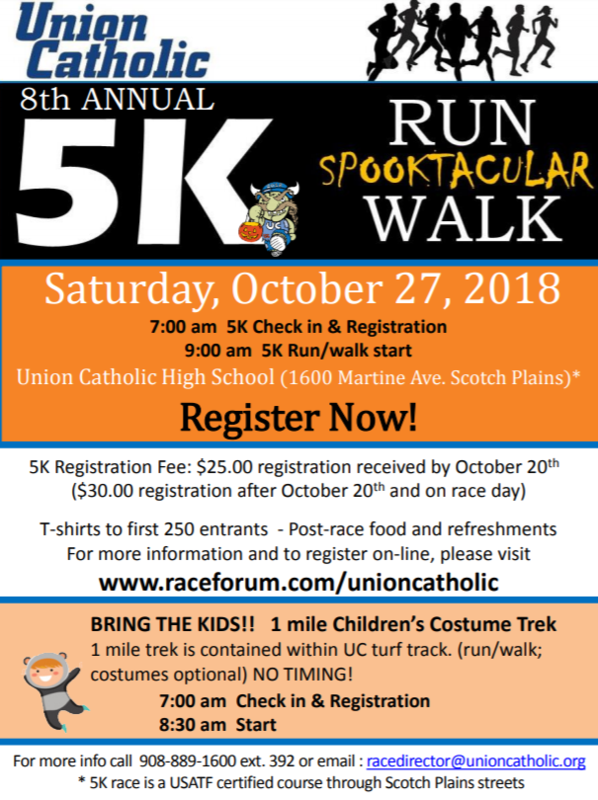 The eighth annual 5K Run/Walk Spooktacular is being held at Union Catholic High School on Saturday, Oct. 27. A one-mile children’s costume trek will be held on the Union Catholic track at 8:30 a.m. and the 5-K run is scheduled to start at 9 a.m. Costumes are encouraged, and check in time and registration will begin at 7 a.m. for both. Pre-registration, which costs $25 for the 5K and $15 for the 1-mile trek, must be received by Saturday, Oct. 20. Registration after the 20th and on race day costs $30 for the 5K while the 1-mile trek cost remains $15. T-shirts will be given to the first 250 entrants. There will be post race food and refreshments, and lots of awards and prizes will be given out. 1 Mile Trek: Candy and participant ribbons to all 1 mile finishers. Course: 5K race is a USATF certified course through Scotch Plains streets ending on Union Catholic’s turf track complex. 1 mile trek is contained within UC turf track.